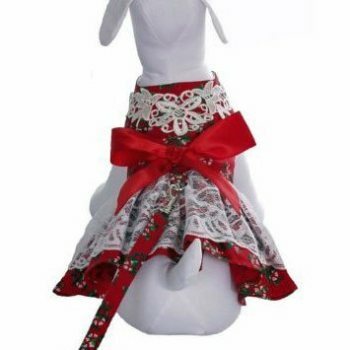 Festive layered holiday dress covered with french lace! This dress is so adorable, made with a lightweight cotton fabric, embellished with a unique candy cane print, lace, trim and a red bow in the center, PERFECT for CHRISTMAS gatherings. Comes with a matching leash. Velcro closure.